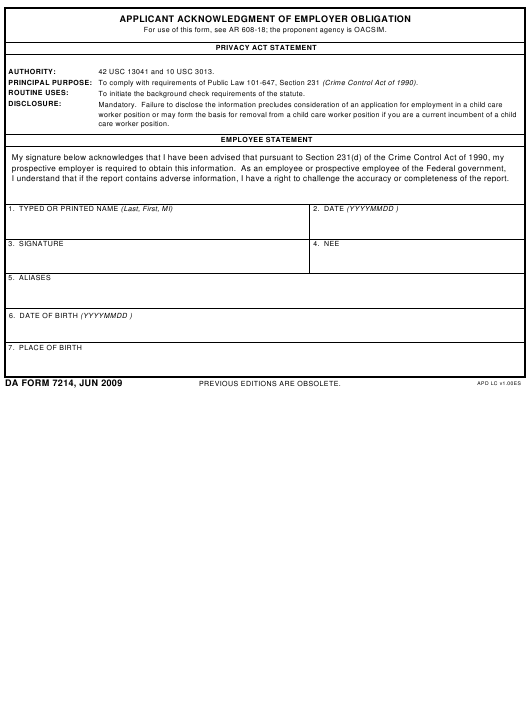 DA Form 7214 or the "Applicant Acknowledgement Of Employer Obligation" is a Department of the Army-issued form used by and within the United States Military. The form - often incorrectly referred to as the DD form 7214 - was last revised on June 1, 2009. Download an up-to-date fillable DA Form 7214 down below in PDF-format or look it up on the Army Publishing Directorate website. For use of this form, see AR 608-18; the proponent agency is OACSIM. 42 USC 13041 and 10 USC 3013. To comply with requirements of Public Law 101-647, Section 231 (Crime Control Act of 1990). To initiate the background check requirements of the statute. I understand that if the report contains adverse information, I have a right to challenge the accuracy or completeness of the report.